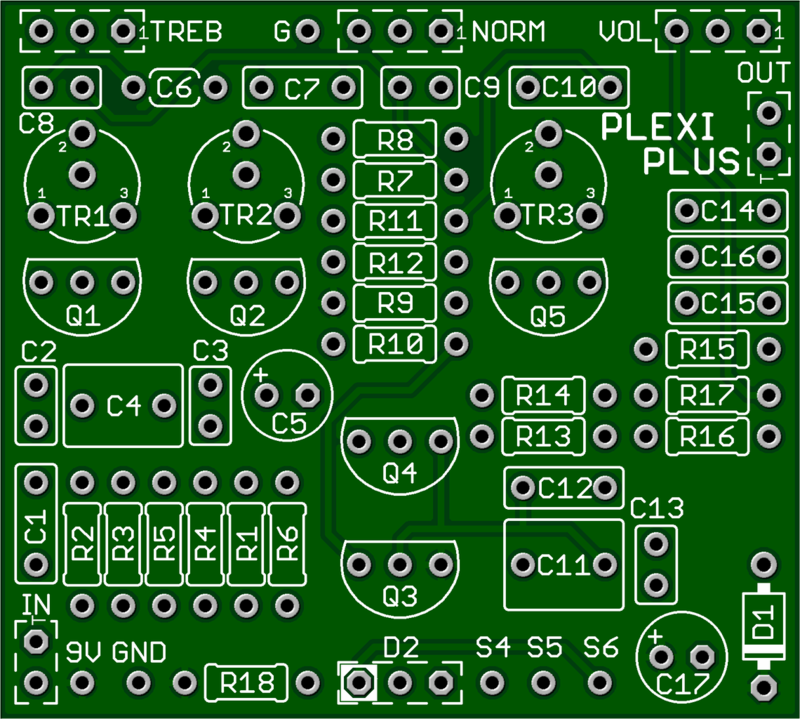 This kit includes all of the parts needed to build the GuitarPCB Plexi-Plus project. This circuit is designed to emulate the sound of a 70's Marshall® Plexi™ amplifier's overdrive/distortion tones, and does it as well as any circuit we've heard. Plexi-Plus uses two stages in parallel, one for the bright channel, and one that ties in the fat tone of a full stack. The circuit uses individual JFET gain stages to create the ultimate variety in a distortion/overdrive pedal. No op-amps or clipping diodes are used. The Plexi-Plus comes with a 125B enclosure and cream color Davies 1510-style knob. All of our pedal kits include a jack for a DC power adapter but no battery snap. If you wish to add a battery snap, please add a battery snap kit to your cart in addition to the pedal kit. Please see what is provided in a kit? in our FAQ for more details of what is included and what you will need to provide to complete the project. Plexi™ is a trademark of Marshall Amplification PLC®. Pedal Parts and Kits is not associated with and makes no claims to these trademarks. See our FAQ for more details. Check out this demo by Barry at GuitarPCB!